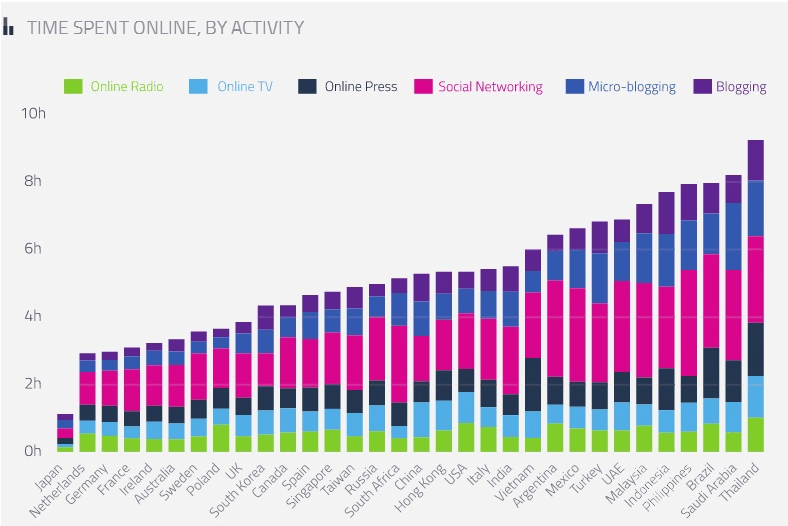 A new research on global media consumption trends conducted by GlobalWebIndex recently revealed that number of people spending more time each day on online rather than traditional forms of media is increasing fast in most of the countries. In fact, it was revealed by the study that there are only a few countries such as the UK, Australia, Poland, Germany, the Netherlands and France where traditional still leads and if you look at the ratios, they are quite close even here. Talking about the daily average time spent on online media, it is found to be 6.09 hours at present globally, up from 5.55 hours in 2012. If you take examples of countries with fast growing markets such as Thailand, Malaysia and Brazil, online populations here are the most digitally orientated among all, consuming 8 hours or more on average, which reveals a very common trend of internet users in these country – of spending the most time online usually. • Globally, traditional TV remains the single biggest media platform – accounting for an average of 2.58 hours spent per day by people watching it, which makes up for a 23% share of total time spent on media. Online TV is also exhibiting consistent rises with an average of 0.7 hours spent per day watching it, which is a 6% share. • With internet users watching TV 4.33 hours per day on average, the USA remains the biggest television market in the world while internet users in China are found to be the second biggest consumers of online TV by spending typically 1.03 hours on it per day however when it comes to watching television overall, they are found to be doing it least by spending just 2.20 hours per day on average. • Internet users in the majority of countries at the present typically spend more time on online rather than physical print press making the Printed Press to be the most digitized form of media. 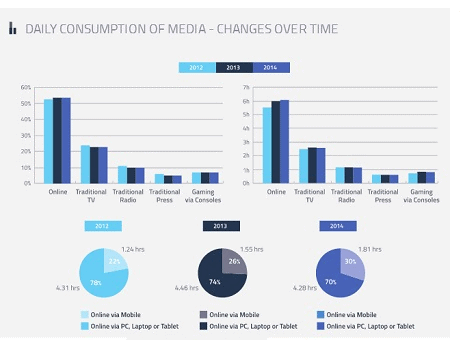 • With 30% of the time users spend on online media, Mobile has seen a rise of 8% from 22% in 2012. Moreover, it has made the vast majority of consumers to digitally multitask while they watch shows. • People falling in the age group between 16 and 24 are the biggest consumers of media via the mobile internet as they typically spend 2.77 hours per day, up from 1.88 in 2012. 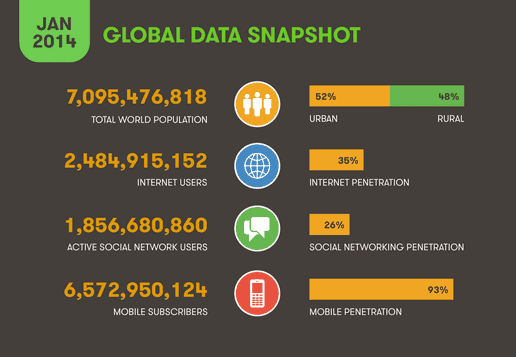 • Social is found to be the dominant online media activity in almost every country surveyed. In fact, social networking and micro-blogging together account for almost 2.5 hours of our daily online time , which is more than 40% of the online activities that usually happens. On a typical day, roughly, how many hours do you spend on/doing the following? One typical day, roughly how many hours do you spend online via the following devices?